In a photograph, Salir Omer looks like most 19-year-olds. A wide smile beneath the brim of his New York Yankees hat reveals a full set of braces. His stance emanates teenage swagger. But Salir Omer isn’t like most 19-year-olds – at least not in America. Omer’s days are marked with simple ambitions – go to work, be free, find peace. And all of it starts with his bicycle. Each morning, Omer rides on busy thoroughfares and empty streets, meandering across the city to his maintenance job at WalMart – likely unnoticed by any car that passes him. “Sometimes, it’s good,” Omer said. “Sometimes, it’s hard, you know.” But he keeps riding. Not because he wants to, but because he has to. His life depends on it. His mother’s life depends on it. His seven siblings who live with Omer depend on it. He is the sole provider – and right now his bike is the lifeblood of the Omer family. Omer is from Somalia – an eastern African country that borders Ethiopia and Kenya –and gained refugee status in America last year when he and his family escaped years of incorrigible danger in Somalia, Yemen, and Egypt. According to Utah’s Refugee Services Office, Omer is one of some 46,154 refugees who have arrived in Utah since 1988, each of whom fled for something better: perhaps freedom or simply a chance for survival. Just like Omer, many of these refugees have found purpose and gusto in a simple day’s work – and it’s all begun with their pedals and a crank. In a city full of fixed gear riders, mountain bikers, and road cyclists who all pedal on pretty, fancy, or otherwise hip bells and whistles, another group of cyclists is overshadowed, forgotten, or never noticed at all – not even by the cyclists who ride for the statement it makes. They are the Invisible Cyclists – people like Omer who feel lucky to have any bike at all, no matter its type. They don’t bike for recreation or to proclaim their communiqué. They bike for food. They bike for necessity. They bike for survival. Perhaps that – in itself – is more of a statement than any deliberate action could ever foster. This contingent of unnoticed cyclists spans far beyond the encompassing refugee population, however; it is imbedded far more deeply into the roots of America – including groups of homeless veterans who somehow slipped through the cracks. Community Services in Salt Lake City. The men at this facility often bicycle together — for transportation and to cope with their lives. Robert Quillen is one of those people. At 58, he’s had a career as a weatherman for the United States Air Force, he’s been an ironworker and a piano technician, an award-winning painter, and he started a degree in metallurgy. He’s also been homeless, a shoplifter, addicted to drugs – and a cyclist. He spent the decade of the 1990s in California working on pianos, cycling along the beach, breathing fresh air, and painting when he could. But Quillen found himself leaving California for his hometown, Ogden, Utah, where he continued to cycle – not because he had to but because he liked to. In 2005, Quillen was riding to work and was hit head on by a driver who had fallen asleep at the wheel. His helmet was the only thing that saved his life as he flew through the driver’s windshield and shattered his legs and arms, his pelvis, and his brain hemorrhaged. He and his bike were crumpled up like balls on the pavement as the driver sped off. “Later the doctor told me, ‘If you hadn’t been in such good physical shape for your age, riding that bike every day, you wouldn’t have made it. We almost lost you a couple of times,’” Quillen said. After his accident, Quillen found himself deeply involved in the use of marijuana and methamphetamines. “I guess I used the accident as an excuse to do drugs. So I was homeless, using drugs. Everything seemed to go downhill when I moved back to Utah,” Quillen said. 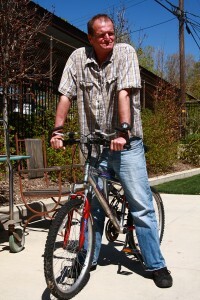 Biking had since become a necessity for Quillen, who found himself catapulted into the midst of the population of homeless Utahns who rely on cycling for survival. In January 2010, there were 3,372 homeless people on the streets in Utah, though roughly 15,647 people were projected to experience homelessness by the end of that year, according to a report funded by the state of Utah. The Department of Veteran Affairs (VA) estimated that the number of military veterans in Utah in 2010 was around 155,052, according to the same report. Of which, about 339 of those veterans were homeless on a single night – roughly 22 percent of the population. Because of this trend, Salt Lake County District Attorney Sim Gill established drug courts in Utah more than 10 years ago – a program that helped place Quillen into a rehabilitation program after he was arrested for shoplifting. Gill’s focus to reduce the rate of incarceration has been to promote rehabilitation. After treatment in drug courts, Gill said, the recidivism arrest rate—that is, the likelihood in which people commit new crimes—decreased from 68 percent to around 23 percent. Quillen has been in and out of drug rehabilitation until the VA and Utah’s Mental Health Court acknowledged that he needed help. Now, more than ever, cycling has become a necessity in Quillen’s life – not just because it’s how he moves around this city, but also because biking has become his main coping mechanism to battle his addictions, his depression, and his ongoing physical ailments that resulted from his accident. Robert Quillen often rides his bicycle to a nature trail and uses it an an easel for his oil paintings. 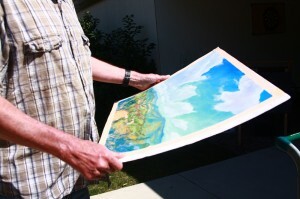 In 2008, he won an art competition through the Ogden Art Club. Though Omer and Quillen have likely never met, they are deeply connected: not simply by their reliance on their bicycles, but by community support they have received from organizations whose goals are to diminish this undeniable invisibility and foster assimilation into the community. Omer and Quillen are both clients at Catholic Community Services (CCS) of Utah – an organization that helps resettle refugees and provides residential drug rehabilitation for veterans and homeless men. Among other things, CCS enables their clients to have access to a bicycle – even if they can’t afford one. Amanda Cornelius, a therapist who works with the drug rehabilitation clients at CCS, said that having access to a bicycle broadens her clients’ worlds. The Salt Lake City Bicycle Collective – a local bicycle advocacy group and community bike shop – works directly with non-profit organizations like CCS to make sure that people who need a bike have access to one. The Bicycle Collective gives about 1000 bikes per year to those in need at their Salt Lake location alone, said Jonathan Morrison, the group’s executive director. “The program we created benefits us because we can make very safe and accurate assumptions about the people we’re helping without asking them anything,” Morrison said. Because the Collective works directly with non-profit organizations, only those who are truly in need of transportation are recommended to the Bicycle Collective’s program. Omer is a shining example of the positive impact that the Bicycle Collective’s work has on an unnoticed community in need. Todd Tapp, the Lead Job Developer at CCS, said that any client he takes to the Bicycle Collective is able to choose the bike that they like best. 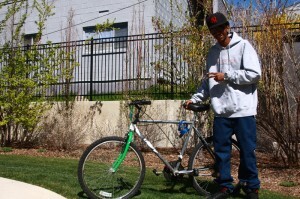 Omer said he chose his bike because it was big. Morrison said it takes about 60 dollars to create a bike that is safe and in good working condition, which people in the community can donate to fully sponsor an individual. A bike isn’t just a bike for these people – it’s a lifeline and a hope for the future. For Omer, that hope is freedom and life in America. For Quillen, it’s a hope to enjoy life’s simple pleasures again. “In Europe they do this thing where they take a three-wheel bike and you fold it out by the beach or something like an easel and then you just paint,” Quillen said. “You can go places on a bike that you can’t go in your car,” he added. And for an invisible cyclist, the possibilities seem endless. If you’re interested in sponsoring a cyclist in need, visit www.bicyclecollective.org/sponsor to donate.